Green iguanas are a varied group. Like humans, they come in a range of colors and attributes. Some are brown/tan/cream, while others are blue. In breeding season and out, some are brilliant orange or look like they got rusty in the rain. These are just a few of the 29 different reclassifications of the species since Linnaeus first classified them in 1758... 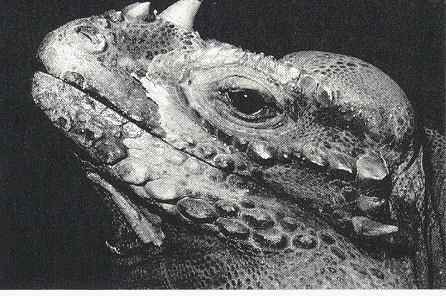 The most recent is still I. iguana according to all the sources I have. For more information on iguana classification, please see the Iguana Classification article; for more information on colors and patterns, see Iguana Skin Color. You can also look at a complete listing of Iguanidae at the TIGR Reptile Database. 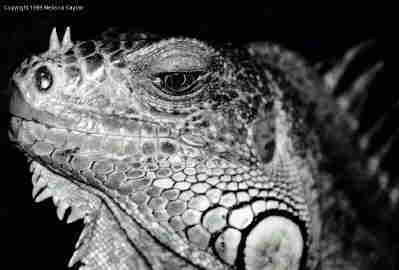 Some importers, pet stores and iguana keepers who don't (yet!) know any better will insist that green iguanas with nubs or horns are "rhinocerous iguanas" some insisting that they are a different species. They are not. Just as blond fair-skinned humans are the same species as black-haired dark-skinned humans, and just as chihuahuas are the same species as St. Bernard's, horned green iguanas are the same species as the blue skinned ones, which are the same species as the green ones, regardless of their skin patterning or coloring. One of the Cyclura species, the Cyclura cornuta cornuta (cornu = Latin for horn) and the only iguanid legitimately called rhinocerous iguana, has a very different skull and facial structure than the green iguanas. For more information on Cyclura, please visit the Cyclura.com.